Ribbon is one of the most versatile scrapbook page embellishments. It comes in a huge variety of colors, styles, textures, and widths. Many scrapbook manufacturers sell ribbon in coordinating sets making it easy to decide which ribbons to use together on a scrapbook page or paper crafting project. You can even save ribbon from gift packaging, hair ties, and more and recycle it as scrapbook page embellishments. These 20 ideas will show you how to make flowers, bows, book bindings, borders, and so much more for your scrapbook pages, greeting cards, and other projects with ribbon. Ribbon is frequently used flat on scrapbook pages or greeting cards, however with this technique you can add some depth to your pages. By gathering one edge of the ribbon you can create beautiful flowers. To finish off each of these blossoms, we added a button to the center. In the article, DIY Ribbon Flowers, you will find step by step instructions for this 3-D scrapbooking technique. Make Christmas cards or holiday scrapbook pages extra festive with this easy technique for turning a piece of green ribbon and some mini brads into a quick evergreen tree. You may want to use adhesive to hold the ribbon in place as you tack it down with the mini brads. Adding ribbon to chipboard is a technique that uses tools and supplies that you most likely already have on-hand. Adding strips of coordinating ribbon to a cardstock shape gives that scrapbook page embellishment extra style and texture. If you are like most scrapbookers, you have quite a stash of ribbons in your supply closet. Consider making an organizer box to keep them all neat and tidy. A bow made of ribbon can be used to dress up scrapbook page with themes as wide-ranging as baby, heritage, wedding, or even birthday. Lots of little pieces of ribbon were used to make this dimensional scrapbook page border. The pieces were each held in place by a small amount of adhesive and then tacked down permanently by running a sewing machine stitch down the edge of the page. This technique uses two types of ribbon — one thin ribbon that will fit through the holes in large buttons, and one wide piece of ribbon that becomes a 3-D border. The buttons are tied to the large ribbon by using the thin pieces. Kay Wallace created this intricately woven mat of ribbon for her scrapbook page. Simply select coordinating colors of ribbon and weave them together in the style of paper placemats. Fold the ends of the ribbon around the back of a piece of cardstock or chipboard for added support. You can then use the woven ribbon rectangle as a photo mat for a focal point photo or a journaling box. You can add extra "pop" to your wedding pages with this paper tearing idea. The scrapbook page looks as if it is being held together with ribbon knots. A second patterned paper peeks through the opening and is really the piece that holds everything together. This fun technique would work on almost any theme of scrapbook page. If we can make ribbon into flowers as shown in idea #1 above, then we can definitely use ribbon to make leaves and stems for those flowers. On this scrapbook page, the flowers are made from paper and the texture is added to the layout with the green ribbon. Ribbon knots are simply small pieces of ribbon that have been tied and pulled tight into tiny knots. This knots can be tied through holes punched in your scrapbook pages or photos mats or the knots can simply be glued in place with GlueDots. Either way, they are a quick way to add style and texture to your scrapbook page layouts. The look and texture of ric-rac ribbon is wonderful. You can use it simply as a quick border on a scrapbook page or as shown here to create a scene on the layout. Once again, ribbon is used as the stems on the flowers, but take note of how this specialty type of ribbon gives the page an all-together unique look. Frames can be made for photos from chipboard, slide mounts, or even cardstock weight stickers. When you tie several frames together with ribbon you can create a fun border that can feature photos or other embellishments inside each one of the frames. The 3-D flip flops are a fun and funky summer scrapbook page technique that uses little bits of ribbon for a touch of realism. This article shares the step by step instructions along with a free pattern so that you can add these cute little items to your next beach layout or summer party invitation. Can't find just the right color of ribbon to coordinate with the papers on your scrapbook page? Don't worry, this article shows you how to use thin strips of paper and a little machine stitching to add texture to your scrapbook pages without real fabric ribbon. Ribbon makes great binding material for mini scrapbooks. Here you can see just how adorable ribbon can make a pile of classic brown paper bags. You can print on almost anything that is flat enough to fit through your printer. This article shows you how to print on cork, fabric, and yes, even ribbon. This technique allows you to make custom printed ribbon for your scrapbook pages and greeting cards. 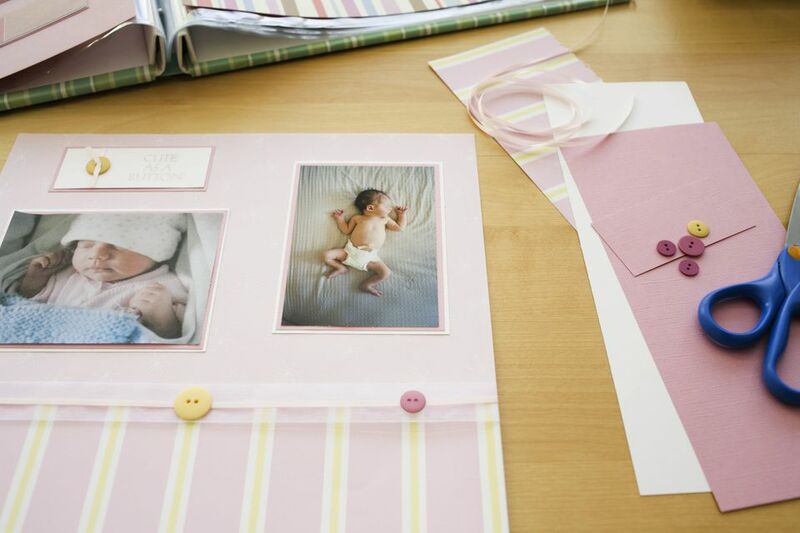 Wrapping a piece of coordinating ribbon around it is the perfect way to finish off one of these little mini scrapbooks. These mini albums make fabulous gifts for family and friends. Little flags and banners are a popular trend in scrapbooking. With toothpicks and small pieces of ribbon you can copy this trend in a unique and creative way. And finally, by adding letters to a piece of ribbon you can create a page border that also serves as the title. Simply print the letters on cardstock and cut them out into any shape that you choose. Mount those pieces on a length of ribbon that runs either up and down or across your scrapbook page for a quick and easy border.